Today’s guest blog post comes from Aaron Cohan. Aaron Cohan is the Director of Strategic Solutions for Amerra, an award-winning medical visualization company. He works with life-science companies across all stages of their product pipeline to adopt and develop visualization components that facilitate their communication to meet business objectives. Not long ago, 3D animation was considered expensive and challenging by many because the development was so specialized. It was predominantly being injected into medicine and healthcare to help with patient education and surgical techniques, but because content changes so rapidly, it often became obsolete once complete. In the age of todays technological advancements, medical animation and visualization is now providing cost-effective communication that has demonstrated behavioral change to a variety of audiences. The life-science product pipeline needs to deliver complex information, and medical animation provides a unique solution allowing companies to tackle those efforts. Now more than ever, the so-called ¢‚Ç¨ÀúTwo guys and a PowerPoint presentation is becoming increasingly competitive, and with narrow windows of opportunity, many of these emerging life-science start-ups are turning to visual components that immediately grab their audiences attention to deliver their value propositions. By having a solid foundation in place, 3D animation facilitates growth by empowering communication efforts to increase understanding of pre and post-product launch. The beauty of medical animation today enables even simplistic pieces to reach other audiences such as manufacturing and distribution channels. Unlike the 90s where cell phones were just emerging as devices, nowadays they are being used to connect practitioners to patients and sales forces to profitable targets. Company strategies are being refined to use these delivery vehicles to connect their products for increased touch points. Quickly going by the board are the days where sales reps, in large numbers, are calling on health care professionals or any client for that matter. Fast and efficient communication from multiple channels is now the expectation. Data journalist David McCandeless points out in a recent presentation that visualization compresses knowledge and learning, and thus makes the case that it should be incorporated as a communication objective. Last year the pharmaceutical industry cut over 50,000 heads, most being sales reps. These cuts are recognition of the lack of call productivity and dead time during and between calls. The old styles of sales and education are no longer successful and certainly not cost efficient. Tapping into new technologies and using imaging and 3D visualization to captivate and inform are quickly becoming the new norm. Delivering a specific message instantaneously across new and engaging platforms, specialized for mobility and tablets, is providing innovative ways to measure the impact of your message. These leading initiatives such as informed consent are paving the way for new compliancy and adherence objectives that continue to become increasingly complex. Real-time metrics give internal strategists a way to improve the efficacy of the message and refine its delivery process to maximize revenue gains. It is one thing to give a patient procedural documentation for education, but to give all stakeholders ranging from the physicians to the hospital administrators better messaging tactics, creates better outcomes. 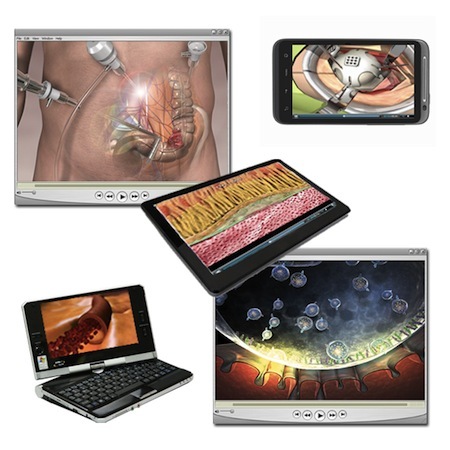 3D visualization is not just a part of medicine and healthcare now; its providing interactive training and education methodologies that is impacting the industry with advanced communication. By connecting users to medical technologies simplistically and cost-effectively, the created value is providing needed avenues to impact higher ROI. And although return on investment is ultimately calculated by dollar signs, it is also achieved by knowledge comprehension of your audiences. agree totally— as a busy dermatologist, it is no longer practical to meet w/ sales reps in person during the workday. if we could be presented with pharma data via computer animation on OUR time, it would be more enjoyable, more informative, and we would more likely expose ouselves to such info!